These glorious Air Fryer or Ninja Foodi Copycat Chick-Fil-A Chicken nuggets taste very close to the real thing! Juicy and crispy nuggets that melt in your mouth! Copycat Chick-Fil-A nuggets are my favorite item on the menu. I am gonna be honest, I could live off chicken if I could! Chicken nuggets are a weakness! I am not talking about the nuggets that are pressed together, I am talked about Chick-Fil-A style nuggets with real pieces of chicken! I was craving these nuggets so I pulled out my Ninja Foodi and got to work. I knew I could get that fried taste and texture with my crisping feature. 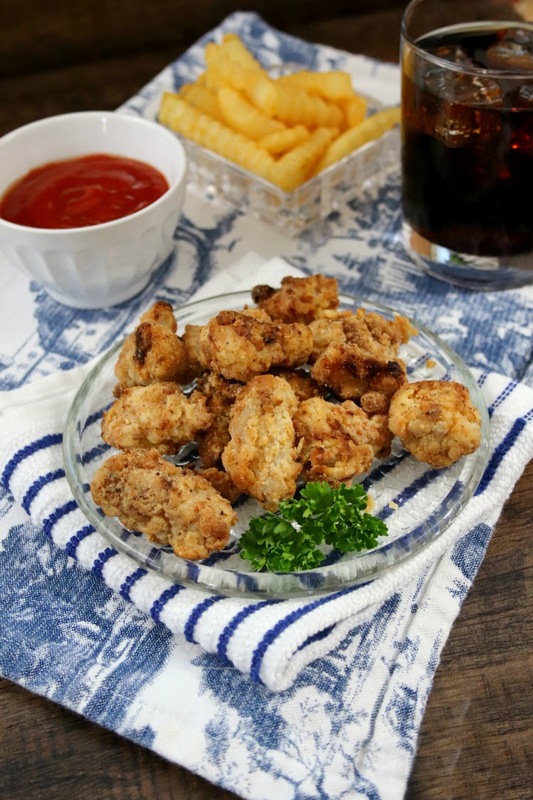 These Air Fryer or Ninja Foodi chicken nuggets turned out perfectly! They had a nice crunch on the outside with that juicy and flavorful chicken on the inside! The Ninja Foodi is an Air Fryer and Instant Pot in one essentially. So you swap and use the crisping lids which offers the exact same cooking process as an Air Fryer! That’s why you can have success with either device! They both crisp up for that deep fried texture and taste WITHOUT the grease! Does Chick Fil A marinate their chicken in pickle juice? Yes, they do! 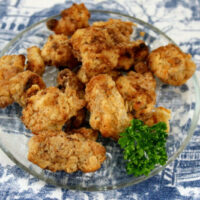 This helps to give their chicken that juicy flavor and offers a tender nugget texture. Plus the pickle juice offers a unique flavor that stands out in a crowd. That is why you see in my recipe I too marinade in pickle juice! How do you reheat Chick Fil A Nuggets? You can warm these in the oven at 350 degrees or pop in microwave. You just want to heat the nuggets until they are heated through. Then pair with your favorite dipping sauce and enjoy! Pairing is easy for these nuggets, cause it works with about anything. Let me share some of our favorite ways to serve our homemade Chick Fil A Air Fryer Nuggets! You can store your leftover Ninja Foodi nuggets in the fridge for up to three days. I will say these do taste best fresh. You will have that crispy crust, and as it cools in the refrigerator, it will become a little more soggy in texture. They are still really good leftover. But, fresh is always best in this route. While I have not personally done this, I am sure you could freeze what you don’t use! Just toss in a freezer bag or air tight container and toss in the fridge for up to two month. Warm in the oven or microwave when ready to serve them up! This would be great for quick lunches! Give this recipe a try today! 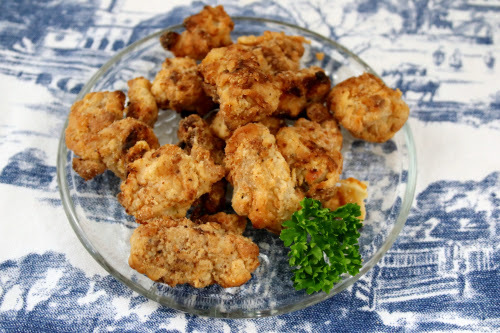 I think if you are a fan of Chick-Fil-A you will be a fan of these homemade copycat nuggets! Steps 1-2: Add the dill pickle juice and chicken to a gallon size Ziploc bag. Seal and place in fridge overnight. Steps 3-5: Add milk and egg to a small bowl. Whisk together. Steps 6-7: Drain chicken from pickle juice and add to milk and egg mixture. Coat well. Steps 8-13: Add flour, confectioner’s sugar, salt, pepper and paprika to Ziploc bag. Add chicken to bag and shake well to coat. Steps 14-16: Pre-heat Air Fryer at 375 for 2 minutes. Dip chicken into melted butter and spread evenly into Air Fryer. Cook for 5 minutes. I added this step to brown the chicken more. You can leave this step out and not lose any delicious flavor. Step 17: After 5 minutes, turn chicken over and cook an additional 5 minutes, or until browned and cooked all the way through.